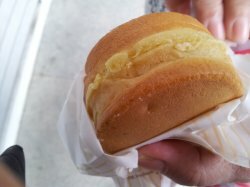 Mr Bean's Caramel Custard flavoured pancake is my favourite among all the flavours available. The fillings in the pancake is really generous, the moment you take the first bite, the caramel custard will ooze out. The caramel custard is sweet but you do not get sick of it. It taste most delicious when it is hot as the outer layer would be slightly crispy and the caramel custard inside would be warm. You would feel happiness when you eat this caramel custard pancake.